UPDATE: Orchard Park Police now say this was a prank that went too far between family members. 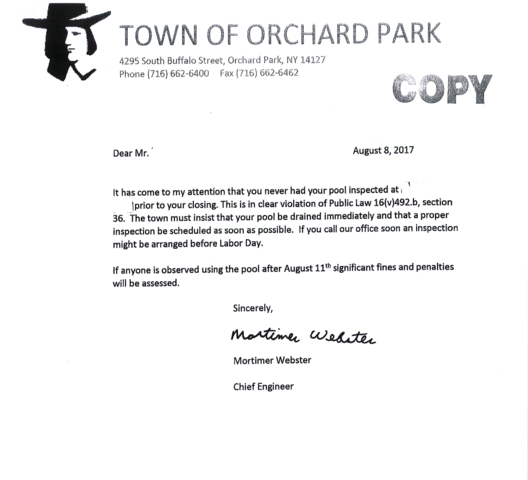 Police in Orchard Park want you to know about a pool inspection scam making the rounds. Officers say someone is sending letters to residents, telling them of supposed code violations involving swimming pools. Homeowners are then instructed to call for an immediate inspection. If you receive a letter from the building inspector's office, and believe it to be a scam, you're asked to call the Orchard Park Police Department at 716-662-6444. You'll find a copy of the bogus letter below.